A first aid kit at the workplace is required for two essential purposes: to enhance the safety of the employees at that worksite by providing immediate assistance in case of an injury or accident, and to ensure that the check boxes of all applicable legal guidelines are successfully ticked. Does your existing first aid kit meet these twin objectives? Or, how do you go about ensuring that the first aid kit that you select that meet these objectives? Alsco has broken this down into a 3-step process that all business owners can follow. Step 1 – DIY First Aid Kit or a Managed First Aid Kit? Have you had a look at your DIY, self-assembled first aid kit? Does it look like a mess of crumpled boxes, open bottles, unknown potion and weird lotions? Are there discoloured and faded old products which can be pulled from somewhere within the muddle of assorted products? In the case of an emergency, do you end up rummaging through all the supplies in order to find what you require? And when you do eventually find it, how many times is it past its expiry date? Assembling a first aid kit is more than putting together an assortment of supplies into a cabinet. For effective delivery of first aid at the time of an emergency, all the contents need to be intelligently organised and clearly labelled. The supplies should be arranged in a manner that they are easy to retrieve whenever they are required. The Alsco first aid kit takes it a step further. The supplies are carefully grouped into injury-specific modules, whether it is a ‘burns’ module, an eye module or a serious injury module. Each module is colour coded and clearly labelled for swift and easy identification. The impressive organisation of the Alsco first aid team is also observed in the contents of each module. Each module contains just the right amount of supplies needed to treat an injury. These supplies are placed in the order in which they would be required. So when you open the box, the things required first can be found right on top – typically a pair of gloves to be worn. The organisation of the first aid kit simplifies the actual delivery of first aid and assistance to the injured and provides confidence to the first aider to manage the first aid emergency competently. Most managed first aid kit suppliers have the years of experience and the knowledge of experts to help build a well-organised kit for their customers. So why not leave it to the guys who know their job – someone like Alsco? What about the quality of supplies? A self-managed first aid kit contains supplies from the chemist down the road. These supplies, while of reasonable quality, are unlikely to be high-quality hospital-grade supplies which provide superior performance. A typical business is unlikely to have the necessary knowledge and expertise to choose from the different variants of the same supplies available in the market. Are the blue plastic waterproof bandages or the soft, pliable gauze bandages better suited for your workplace? Apart from the minimum supplies and quantities prescribe by the ANSI and WHS standards, what are the other supplies needed for hazards which are specific or more likely in your industry or work site? A few, though not all (so please check), managed first aid kits services have hospital-grade supplies. The Alsco first aid kits do. They also have the correct type and quantity of supplies needed for your workplace. Did you know that blue is the only colour that does not occur naturally in food? Well, now you do. That is the reason why blue colour is used for all non-food items in the food industry. The blue coloured, waterproof bandages are specially designed for this industry and are contained in the Alsco food industry cabinets. While assembling your kit and then at all times thereafter, your kits need to comply with the applicable laws and regulations. Most businesses and business owners find compliance confusing and tedious. It often is! Hazards need to be identified, their risk estimated so that adequate supplies can be maintained. The next thing is to ensure that the DIY kit is of the right size for the number of employees (and visitors) who may be present at any given point of time. Small businesses are not equipped to do this. At the same time, non-compliance could result in massive and onerous penalties. So why not leave it to the experts? It is the job of the managed first aid service provider to ensure that your first aid kit ticks the boxes of the different OH&S guidelines applicable to your state, industry, workplace size/layout. Needless to say, compliance with guidelines is an intrinsic premise of the Alsco service. A lot of effort is required to maintain these kits in perfect condition. First aid kits need to be constantly serviced. For a first aid system to be compliant at all times, it needs to be serviced every time it is used or at least every 12 weeks. The regular servicing is required in order to refresh and replenish the supplies in the first aid kit which may have been either consumed, tampered with or may have little or no validity left. In all these scenarios new supplies are required. In your DIY kit, you or your employees are responsible for checking and sourcing these supplies. Do you realise how much time your employees are spending doing this task which is not really their core job? In the case of a managed first aid kit service like that of Alsco, the same job is done by experts who have proper processes in place which makes the task of servicing far more efficient. An Alsco service agent will be able to service many more kits in the time in which your person will service a single kit. Eventually, it is your business which benefits from the least disruption to your business and the best use of your employees time and effort. We think that a managed first aid kit service certainly sounds like a better solution than a self-assembled and serviced kit. The next step is to figure out which first aid kit service. Did you know that the Alsco Kit is designed to be serviced in under 5-minutes? The service agent has a maximum of eight items to check and exchange. These are the liner and a maximum of seven modules in the cabinet or in the portable bag. The Alsco service agent simply unhooks the existing liner and replaces it with a brand new liner at each service. There is a service register conveniently placed on the door of the cabinet which needs to be filled in on the service date. Each and every new liner reaches workplaces in a plastic seal which is opened at your workplace. This avoids any spillage or tampering with the contents of the liner. 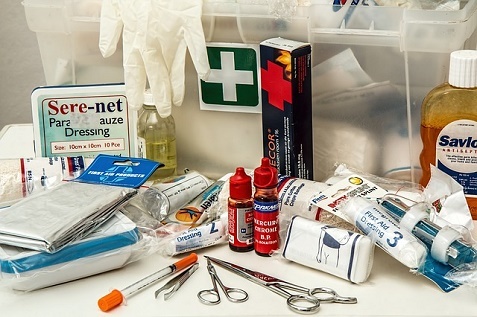 In a traditionally-managed, not properly organised first aid kit there are hundreds of products which need to be checked and replaced individually. Just pause and think of the errors that this system is designed to have. All liners are then returned back to Alsco where they are completely refreshed. This means that all the detailed, time- consuming work is done at the Alsco warehouses and depots rather than at the customer sites. Such a system reduces time spent and the disruption caused at the customer site to a minimum. The servicing done at the client site is completed swiftly and easily. At the Alsco First Aid Warehouse, the liners are checked against a liner map. The map specifies the items and the quantities of each item that the liner should contain. All items in each returned liner are checked for sufficiency of quantity as well as to ensure that they have sufficient validity left to last until the next service cycle. How about the modules? Servicing the modules is just as simple, precise, fast and easy. On the back of each plastic box containing individual modules is an expiry date. The expiry date is applicable for all entire contents of that module. The expiry date is written in large, easy to read font. This means that the expiry date for all the supplies of the box is checked in one single glance. Elementary, isn’t it? The service agent also checks if the contents of a module have been used. This check is a simple and easy one too. Each module is individually shrink wrapped when it is supplied. The shrink wrapping acts as a safety seal for the module. All the agent needs to do is to check if the plastic wrap has been removed or is damaged. In either case, the entire module is replaced with a new one. If a module is missing, that too is replaced. In the case of the portable module, the supplies are contained in a resealable bag with plastic safety seals across the opening. If the safety seals have been removed, the entire module is immediately replaced. The Alsco rental service helps clients to avoid the huge cash investment required to purchase supplies, cabinets and refills required. Alsco charges one fixed annual rate that does not vary with usage. Planning cash flows becomes easier. With compliance having been taken care of, you no longer have to worry about those large penalties, fines or legal costs. It is for these reasons that the option of choosing Alsco as Managed first aid kit service provider has become the obvious and trusted choice of thousands of customers around Australia. Step 3 – Which Alsco First Aid Kit? Now all that is really left for to do is to choose the right first aid kit to meet the requirements of specific workplaces. So whether your workplace is large or small, has many employees or few, is in the food industry or otherwise, whether your employees are largely on-site or out on the field, Alsco has something to meet your needs. Find the right first aid cabinet for your workplace here. That is all there is to it, really. Especially if you are secure in the knowledge that you have an experienced and a professional ally like Alsco First Aid by your side. Take these three easy steps with Alsco today.